Fabiano Caruana’s Fantastic Victory Against Magnus Carlsen! First, I’d like to remind you of the special and massive 40% discount we’re providing you with on our courses based on the world champions. 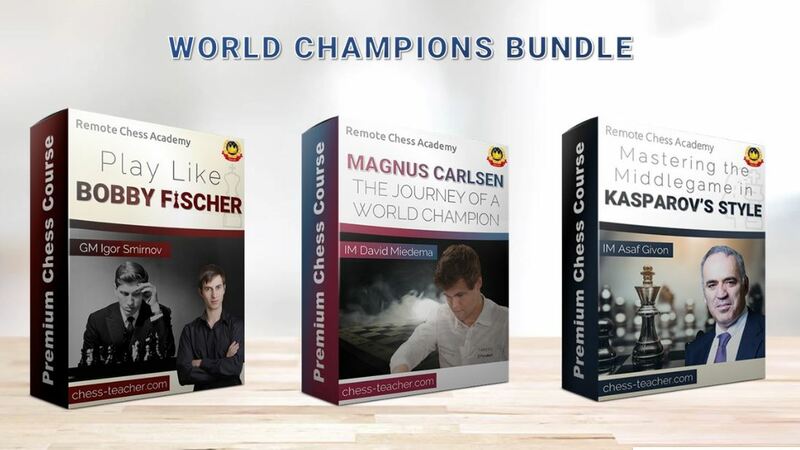 You can get the following courses with a massive 40% discount: “Play like Fischer”, “Magnus Carlsen: The Journey of a World Champion”, and “Mastering the Middlegame in Kasparov’s Style”. These players and several other world champions and great chess players revolutionized the game by bringing a lot of new ideas. It is important for every chess player to not only watch the games of these players, but to learn from them! Simply use the coupon “wchampion”. It is valid only till tomorrow, 18 November. If you don’t know how to use a coupon, please see here. If you want to study all these 3 courses, but think you couldn’t afford them, we’re here for you – you can get the new “World Champions Bundle” that has all these 3 courses for only $179 USD, while the actual sum price is $267 USD (getting $88 USD discount, more than 32%!). A few days ago, our guest IM Asaf Givon had prepared a video for you analysing a game played between Magnus Carlsen and Fabiano Caruana in the 2011 Biel Chess Festival, in which Carlsen won with a brilliant exchange sacrifice. Before going to the next game, let’s take a look at the strengths of these two players. Of course, he is a universal and practical player and he can play really well in any kind of position. But his major strength is his ability to slowly outplay his opponents over time by creating a lot of problems for them, making moves that make them uncomfortable, and also attacking his opponents psychologically. In other words, he doesn’t usually play for immediate advantage, rather for a number of smaller advantages. He is a more scientific player; he calculates a lot of moves during the game and really makes sure that his moves are absolutely the best. He won’t settle even for the second best moves. He is very courageous and he’s often ready for sharp fight. Today IM Asaf Givon has prepared another video lesson for you in honour of the ongoing World Championship Match between these two great players. In this game, Givon chose a game played between the two during the 2014 Sinquefield Cup. In this game, Caruana showed a lot of character and played moves based on the key principles even when the moves played by Carlsen were intimidating. Caruana never got nervous; he kept cool, calculated everything and believed in his calculations. This is believed to be Caruana’s one of the best performances, if not the best, as he won the tournament in a grand style – he finished with scoring 8.5/10 points, winning 7 games and only 3 games being drawn. Did you enjoy these two video lessons from IM Asaf Givon? What do you think about the ongoing World Championship Match? Who do you think will win and why? Please write your thoughts in the comments below. Sign up for my blog updates and never miss a post. 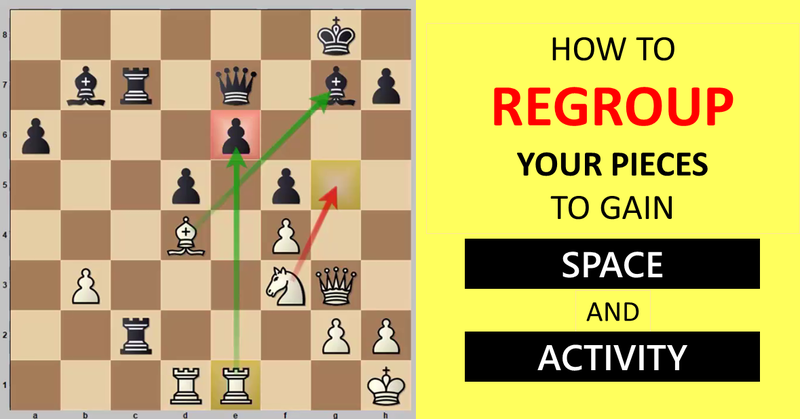 How to Regroup Your Pieces to Gain Space and Activity? Analyze like a PRO now! 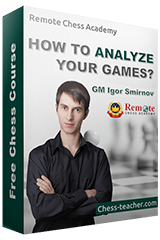 How to analyze your games? We value your privacy! You can unsubscribe anytime. *You will also get our newsletters (articles, video lessons and info about our courses) by signing up! © 2009-2017 Remote Chess Academy. All Rights Reserved. Terms and Conditions. You will also get our newsletters (articles, video lessons and info about our courses) by signing up! We hate spam. You can unsubscribe at any time. What you will get! All for free!